Eye on Romance, an author's most trusted promotional tool. 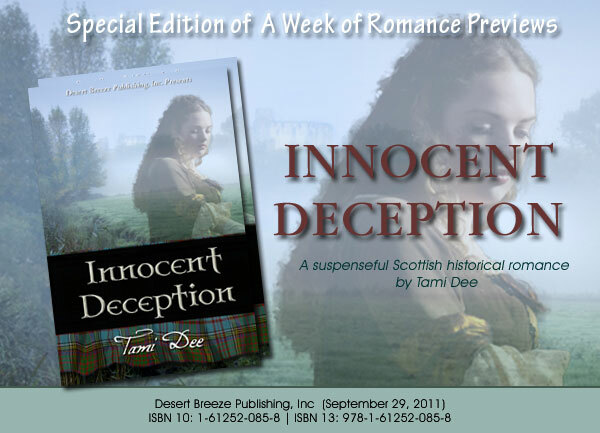 Today we begin our Special Edition A Week of Romance featuring INNOCENT DECEPTION by TAMI DEE. Enjoy! Royal Ethan Anderson… a first born son cheated out of an inheritance by his father in favor of his illegitimate half-brother. Ceana Sinclair, a girl who has no choice but to masquerade as someone else. Can a foundation of trust and love be built upon a lie? Or will this case of innocent deception destroy any chance of happiness Royal and Ceana might have had? Rain beat against the tiny hut in icy sheets, the wind howled and whistled through gaps in the wooden structure. A single candle lit the room, casting long, flickering shadows over the sparse furnishings. Drying herbs hung from the beams holding the straw and thatch roof in place, filling the air with pungent, warring aromas. Two women occupied the single cot room, a maid of fifteen winters, terrified, drenched in sweat, her golden hair plastered to her face despite the frigid midnight temperature. She heaved air in and out of her lungs, panting like a wounded animal between contractions. Tears dripped from her eyes and ran in hot trails to her hairline. The older woman, Meg, slid her hand around the babe's head and turned it face down. Meg glanced up and met wide, terrified eyes. "Don't push yet, lass." Pain spiraled though Caoimhe's slight frame, she dug her heels into the feather mat, instinctively pushing herself upward, seeking an escape from the waves of pain rushing through her without let up. She bit a thick strap of leather so hard her teeth met. Meg continued to guide the infant. "Here it comes." A searing pain ripped a scream out of her throat. Caoimhe's stomach hardened, then a pressure Caoimhe could not control overtook her. She bore down, the babe slid out and into Meg's arms. A smile split Meg's wrinkled face. "'Tis a girl!" A thin cry competed with the howling wind as Meg wrapped the infant in a course blanket, then handed her to Caoimhe. Caoimhe looked at the small, scrunched up face in wonder. "How can I love her so much, Meg, when she was planted in my belly by force?" Meg shook her head, a soft smile curved her thin lips. "'Tis the way of a mother, lass," she answered. "What will ye call her?" "Sorsha." Caoimhe said without hesitation. "I'll call her Sorsha, it means brightness, light." Meg nodded her approval. "Put her to yer breast, child, the suckling will help ye deliver the afterbirth." Meg chuckled. "The next part is easy, lass, don't ye worry." Caoimhe bared her breast and after a few awkward tries, Sorsha was nursing. Love and wonder filled Caoimhe. Had this tiny person come from her body? Caoimhe gasped in pain, her stomach contracting again. "Meg, ye said this part was to be easy?" She sucked air into her lungs and dug her fingers into the cloth covering her daughter. "Meg!" Meg pushed Caoimhe's knees apart, then her brows drew in even as her eyes widened. Panic, hot and alive, seized Caoimhe. "What is it?" She gasped. "What's happening?" Meg flicked a glance to her. "It seems there is another babe," she said. "Ye can do this lass, one more time and I promise it will be over." Somehow, despite her exhaustion and fear, Caoimhe pushed the second infant out of her body without disturbing the daughter still suckling at her breast. Meg held the squirming golden haired little girl up for Caoimhe to see, then rummaged for another blanket to swaddle her in. "Ye have two bonny daughters, lass," she said placing the second babe in Caoimhe's free arm. Meg helped Caoimhe bare her other breast and within moments the babe was greedily nursing. "I don't ken what to call her." Caoimhe confided. Meg wiped her hands on her apron. "There will be plenty of time to name her, lass. Rest now, ye are going to have yer work cut out for ye keeping up with yer chores and two daughters." Caoimhe smiled as her eyes drifted shut. She would worry about the truth of Meg's words tomorrow. For now, she needed to sleep. "They are so much alike," she whispered. "I can't believe there are two. I think I'll call this one Ceana." Meg was silent for a moment. "Fair one. I think that is a lovely name, lass. Ye picked well, for both yer wee daughters." 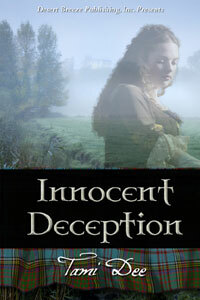 We continue our Special Edition A Week of Romance featuring INNOCENT DECEPTION by TAMI DEE. Enjoy! Meg shuffled around the room as Caoimhe allowed her throbbing body to relax. The door to the hut flew open, Caoimhe jerked awake and she struggled to orientate her thoughts. Wind extinguished the candle and rain pelted into the hut like icy darts. The crash of thunder followed by the flash of lighting illuminated Gormal, the laird's wife of one winter, heavy with child. She stood drenched from head to toe in the threshold, with two of her personal guards flanking her. Meg rushed to shut the door against the storm. "Is it yer time, My Lady?" Terror clutched its icy fingers around Caoimhe's throat. Gormal hated her. She had hated her since the first moment she had set eyes on Caoimhe. Or, rather, Caoimhe thought through her rising panic, the first time she had noticed her new husband setting his eyes on her. "Light the candle!" Gormal demanded. Meg obeyed without comment. When the soft glow once again filled the room, Gormal was standing at Caoimhe's side, the hate in her eyes as strong as a physical blow. "Two?" she sneered. "Two whelps. Are they boys or girls?" Caoimhe swallowed, her hold on her babies tightened and they whimpered in protest. "They are girls." Gormal's lips pulled into a sneer even as she rubbed her belly. "Serves ye right," she hissed. "If ye think ye and those babies will be allowed to stay within these walls, then yer mistaken. I'll not have ye flaunting yer self in front of my husband!" Caoimhe gaped at her and Meg gasped from where she stood behind Gormal, wringing her hands in her apron. Gormal narrowed her eyes and leaned in so close to Caoimhe her breath warmed her cheeks. "Did ye think I did not ken ye threw yer self at my husband at every opportunity? Did ye think I did not ken that ye made him plant his seed in ye?" She leaned in lower, her face almost touching Caoimhe's. "Did ye really think ye and yer whelp could stay here if it weren't a son?" Tears blurred Caoimhe's vision. "But, my lady, it was not like that." She sniffed, struggled to put her thoughts together, to somehow convince Gormal of her innocence. "I -- I did not want him to--"
Gormal raised her hand and Caoimhe shrank back, but there was no way to avoid the slap. Her head snapped back and hit the wall behind her. Light exploded behind her lids and her stomach churned with shock, fear and confusion. Gormal's face contorted with rage. "Get out!" Meg rushed over. "My lady, please, she just gave birth!" she pleaded. "The lass has nowhere to go, she is an orphan herself." Gormal turned her venomous glare on Meg, and the elderly woman stumbled back a step. Gormal took a menacing step toward Meg. "She and the infants are banned from this clan. They leave these gates tonight with only the clothes on their backs." She narrowed her gaze. "Do ye wish to go with them?" Caoimbe's whole body trembled. Her friend, the only mother figure she had ever had, dropped her gaze and shook her head. Gormal ripped the thin blanket off of Caoimhe. "Get out." The two large guards stood silent at the door, their arms folded across their chests and their eyes vacant of emotion. Caoimhe hugged her daughters closer to her. "Please," she pleaded, struggling to shift her legs off the cot. Her bare feet touching the cold rushes sent a violent shiver though her. "Please, my lady, do not ban the babies." Liquids gushed from her body, soaking her thread-bear dress. The room spun but still she kept her hold on the babies. "Ye can't send them out to die." Gormal rubbed at her lower back. "That's where yer wrong," she said, her voice strained. "I most certainly can." Meg watched Gormal closely. "My lady, is it yer time?" Gormal sucked in a breath and clutched her stomach. "Aye," she said at last. "I think it is." She composed herself then turned back to Caoimhe. "Why are ye still here?" The storm raged outside the hut. Desperate, she pleaded for her babies. "Yer child will need a maid when it gets bigger. Let Meg raise my daughters, she can train them how to serve. They can serve yer child, my lady. They, they can serve ye." Another pain caught Gormal in its grip and she clutched her stomach. Meg hovered, wringing her hands in her apron. "My lady, ye should lie down." Caoimhe stood, her body hurt and throbbed as she stumbled away from the only cot. Meg pulled the soiled linen and tossed it into a corner, then quickly retrieved a fresh set and remade the bed. Gormal laid down, her brow filmed with perspiration as her stomach tightened and released. "Please!" Caoimhe could not stop the flow of tears scalding her cheeks. "Please, my lady, let Meg care for my daughters." Gormal panted though a contraction and glared at her. "Fine," she shouted. "Leave them. They will spend their whole lives scrimping and scraping to serve us! Now get out of these gates and never come back!" Caoimhe's legs almost buckled in relief. Her daughters would not have an easy life, but at least they would have life. Caoimhe knew once the gates closed behind her, the only thing waiting for her would be a slow death. There were extra blankets on the floor of the hut, she laid her daughters on top of them with trembling arms, then checked the swaddling confining her daughters. Through her tears she strove to memorize each little face, faces so much like her own with their light hair and blue eyes. She kissed each infant. "I will always love ye." With one last longing look at her daughters, she turned and met Meg's eyes. Meg nodded once, Gormal screeched in pain, and Meg went to work. With nothing but bare feet and the soiled dress on her back, Caoimhe eased open the door so the wind would not extinguish the candle. With the two guards at her heels, she stepped into the bitter cold storm. Ethan's flesh boiled from within, the blood within his veins sizzled and scorched. A low moan escaped his parched throat. He thrashed on his cot, his body hurt, as if twisted this way and that by a giant hand. His mother's concerned face swam before him, her worry cast shadows in her pale blue eyes. "Shh, Royal, I'm here, son, yer not alone." Her voice was a gentle caress as she placed a cool cloth on his forehead. Relief from the heat slipped through him. He forced his eyes open, watched as his ma took the cloth from his forehead and doused it in water from the basin on his nightstand. She wrung out the excess liquid, then placed it back on his forehead. She was the only one who called him Royal, his first given name. Nay one else, including himself, thought he was worthy of such a high sounding name so he was called by his second name, Ethan. A smile trembled over her lips as she watched him. Her hair had come out of its usual twist and hung down her back in a copper curtain. She was but thirty-one winters, having been his own age of fifteen when she had been given to his father as a wife. Thoughts of his father led to quick, disturbing thoughts of his half-brother, Aodh. Tears clouded his vision and he squeezed his eyes shut to keep them from falling. His half-brother, an illegitimate son who his father openly favored. The same age, yet so much taller, stronger, and better with a sword than Ethan. A soft cloth washed away the tears he had failed to control. Shame surged through him. The door to his chamber swung open and the flame of the wall sconce flicked wildly. His father stood in the threshold, a giant of a man reeking of ale. Ethan's stomach rolled with terror. His mother stepped in front of the bed, placing herself between father and son as she had a hundred times before. "Well?" he demanded, in a harsh, raw voice. The question echoed through Ethan's head and his mother's shoulders stiffened. Ethan's vision blurred, the damp cloth resting on his forehead nay longer felt cool, but warm, nay, hot, burning the skin beneath. "I hope the fever kills him." The sound of his father's voice seemed to be coming from a long way away. Ethan felt as if he were drifting somewhere above his body, somewhere safe, where his father could not hurt him. A distressed cry escaped his mother's lips, jerking Ethan back into himself. "'Tis yer fault he is nothing but a weak, sorry excuse for a son." his father said, deliberately cruel. "He doesn't deserve the air he breathes." His mother cast an anguished look over her shoulder. "Don't say that!" she pleaded on a sob. Ethan could nay longer hold his eyes open, his heart raced with fear and hurt and his body boiled from within. He was powerless to help his mother should his father strike her, for Nigel MacLean had nay concern for her health or the health of the babe in her belly. Footsteps rustled through the rushes and Ethan heard his father's ragged breaths, smelt the foul odor of ale, felt the heat of his father's body as he stood at the head of his bed. His heart galloped within his chest, he wanted to run, to hide, yet he did not even have the strength to open his eyes and look at the man who had given him life, then callously cast him away when he discovered his son was less than perfect. For even worse than Ethan's small stature, was his inability to speak clear words. For as long as Ethan could remember, his words came out halting, twisted, and oftentimes sounding breathless, as if he had run through the moors before speaking. His ma rushed to his side. "Nay!" she pleaded. "He's yer son! Yer heir!" There was a slap, his mother fell atop him with a cry. Abruptly, her weight left him. He forced his eyes open just in time to see his father toss her to the floor with the flick of a giant, careless hand. "Nay!" he tried to shout, yet his voice came out a choked whisper. His arms refused to lift him as he struggled to sit up. He needed to go to his mother. She held her stomach, her face pale in the light of the sconce. Pain bracketed her lips and tears spilt down her cheeks. He hated his father, almost as much as his father hated him. His father leaned down, his nose almost touching Ethan's own. "Yer weak," he hissed. "Do ye ken what animals do with the runt of their litters?" Ethan shook his head nay. His father's lips pulled into a snarl. "They kill them." Ethan was shivering now, his body drenched in a sudden cold sweat. His father stood, placed his hand at Ethan's throat and began to squeeze. "If ye were not around," he mused, "then I would have nay choice but to name Aodh as my heir. Unless that babe in yer mother's stomach is a boy, that is." Ethan gasped for air, his vision darkened at the edges and the room started to spin. He managed to grasp his father's wrists but it was nay use, he was too strong and Ethan was too weak. The pressure on Ethan's neck lessened and his father's eyes widened in shock as a sturdy wooden chair crashed over his head. His father fell to the floor as hard as a toppled pine hitting the earth. She stood, her hair hanging in long ropes over her shoulders and down her back, her eyes wide and unblinking as she stared at her husband and the wreckage of the chair lying splintered and broken atop of him. She raised her eyes to find him watching her. "Ye can't stay here, Royal," She spoke in a suffocated whisper. He shook his head, hearing her words but not understanding. His nightclothes were soaked through, his fever had broken yet he was still so weak. One moment she seemed frozen in place, the next she hurried to the chest at the foot of his bed, pulling out his clothing and shoving it into a large leather bag, her panicked eyes darting to his father, sprawled on the floor. Grasping the bag, she came to his side. "Royal, ye have to dress, ye must get out of here before he awakens." Ethan tried to obey, but he could not make his arms move, he did not have the strength. Sileas jerked the thin leather ties of the tote shut and laid the bag at the foot of the bed. His feather mattress dipped with her weight when she sat beside him. She pushed a lock of his hair from his forehead then pulled him into her arms. Tears wet his hair as she cooed her love to him. For one brief moment, Ethan felt safe. His father moaned and the feeling was shattered. His mother stiffened, then pulled away. With trembling, ice cold hands, she tugged off his wet sleep clothes and helped him dress in warm traveling clothes. She pressed her ring into his palm. "Take this," she whispered. "Fionn and Neas are loyal to me, they will take ye to my clan in Ohar Dheathain. They are my guards, Royal, they came with me when I married yer father. They will be yer guards from now on. My sister and brother-in-law will take ye in, raise ye, Royal, and love ye as I do. Sell the ring if ye must, 'tis valuable." She pressed both her hands to his cheeks. "Nay matter what happens, ken I love ye and I ken ye will grow into a strong, fine man." She slid her arm behind his back and lifted him up. Her stomach pressed against his side as he struggled to stand, not wanting to burden her with his weight. His teeth chattered uncontrollably, Ethan could not tell if it the cold came from the chilled air, or from the terror within his body. "Yer coming w-with me, Ma?" Her grip around him tightened and she shook her head. "I can't leave, I belong to yer father. He would follow me." Grief and sudden loneliness griped his chest. "W-who w-will protect ye from h-him if I'm gone?" he tried to demand, but his words came out thin, hollow sounding. Her arm tightened around his waist. "I'll be fine, Royal. Yer not to worry about me." Together they stumbled out of his chamber and somehow made their way outside. Neas and Fionn waited with three horses, each animal had supplies strapped to them. How had they known he would be leaving this night? She grasped his face with both hands and Ethan stared at her helplessly. "Ye must never come back here," she ground out. "If yer father or half-brother find ye, they will kill ye so Aodh can inherit. Take Anderson, my clan name, as yer own. Work hard and earn a place within their clan, earn their respect." At his doleful look she continued. "It will not be as it was here," she assured him. "My clan will not care that yer speech is halted. Ye will grow there, son, ye have to trust me." He nodded, his legs trembled from the effort of standing so long, his heart shattered into a million pieces to be leaving his home without his mother. She pulled him close, so close the babe in her womb thumped against his own belly. She released him and Fionn helped him atop his mount. "Follow the River Dee as much as ye can," she instructed the guards. "It should only take ye a day at best, two at worst." Fionn stood close to his mother, his face showing his concern, and something else Ethan could not identify. "Lady Sileas, are ye sure ye will not come with us?" "I can't, Fionn," she said quietly, grasping both his hands in her own. "If I do, he will follow me on principal alone. He cannot find Royal. My son's life will be forfeit if he does. Now go!" He nodded once then swung onto his mount. Neas had tied Ethan to his mount, knowing he was too weak to keep himself seated. He took the leading strap of Ethan's horse and with a gruff order the horses sprang to movement. Ethan laid against his mounts neck his arms dangling at its sides craning his neck to watch as his mother, his home, disappeared from site. Then, abandoning the effort not to cry, he closed his eyes and let the men his mother trusted with his life lead him. The Laird MacLean reclined at the head table, his head spinning with ale. He wiped the remains of his supper from his beard. The wenches high pitched laughter -- Or were they screams? -- stung his ears as his men, rowdy as ever, grabbed them and enjoyed the bounties of their young, eager bodies. Annoying weeping broke his ponderings. With a chuckle, he amended his earlier assumption. Perhaps all the wenches were not so willing. "More ale!" He pounded his wooden mug atop the scarred table until a lass rushed over with a full tankard. He took a long drought, then shoved the maid toward Aodh who caught her easily. He smiled as the maid struggled in vain to escape his son's sure grip. Aye, Aodh was a son a father could be proud of. Strong, skilled in weapons, and as ruthless and greedy as he himself was. Aodh was nothing like Ethan, wherever he was. Nigel had awoken in the rushes of his son's chamber, amidst a broken chair, with his head pounding. Once he had discovered Sileas had sent the boy away Nigel had beaten Sileas half to death. The only thing that had kept him from ending her completely was the off chance she carried another son. For regardless how proud he was of Aodh, if she gave birth to a legitimate son, that lad would become his heir rather than Aodh. He chuckled. It would be entirely Aodh's call if he let the babe survive and take what had been promised to him. Either way, Nigel's lands and clan would be left in strong hands after he left this earth. The timid voice brought his head up. A lass, one he was relatively certain he had not bedded yet, stood trembling before him. Crude shouts rang out and several pairs of drunken hands grabbed at her skirts. She balanced, yet kept her place before him. "My Laird," she said again, "I have news about Lady Sileas." His good mood instantly soured. "What is it?" he demanded. She swallowed and cast her eyes downward, wincing as one of his men pinched her bottom. "'Tis sad news, my laird," she whispered. "She has given birth to a son- -"
He smiled. Ah, a son. Well, it was a good thing he had not beaten her to death after all. He eyed her as she stood silent before him. "And what is the bad news?" he bit out. Her eyes met his, full of dread and fear. "He--he was stillborn, Laird." He stood abruptly, the legs of his sturdy chair scraping through the rushes. "What?" he roared. Several heads turned his way, and the shouts and harsh laughter quitted. The frightened maid's breath came out in small gasps and could be heard throughout the great hall. Her hands clutched her skirts. "Stillborn, Laird." Tears ran in a stream down her cheeks. "The Lady Sileas, she did not survive the birthing." He met Aodh's bright, excited eyes. Nigel saw the irony of the situation and he laughed. "She was not able to give me even one worthy son," he bellowed. "If she had not perished, I would have killed her myself." He grabbed the weeping maid and pulled her roughly onto his lap. He'd give her something better to cry about. This is our last day of our Special Edition A Week of Romance featuring INNOCENT DECEPTION by TAMI DEE. We hope you loved it as much as we did! Sorsha shifted on the mount and Ceana struggled to keep her own seat behind her mistress without actually touching her. "Ye stupid imbecile!" Sorsha screeched. "I'm sick of sharing a horse with ye. Get off, now." With a shudder, Ceana glanced at the ground. The horse was big, and moving at a steady clip. If Sorsha did not stop him, there was nay way she could dismount. It would do her nay good to have Sorsha see any sign of weakness. Nay, her mistress preyed on others weaknesses just like her mother, Lady Gormal. "I said get off!" Sorsha hissed. She thrust a plump arm behind her and pushed. Ceana tumbled off the horse and hit the hard packed earth with a painful, breath-stealing jolt. Instinctively she rolled away from the horse she'd been riding, only to roll directly in front of another mount. The horse's panicked whinnies quickened her already racing heartbeat. She threw her arms over her head and curled herself into a tight ball as their guard's horse reared up, its mighty hooves trying to catch a foothold in thin air. Dust choked her and chunks of earth dislodged from the beast's hooves pelted her. The horse's panicked reaction to her sudden appearance in his path caused a chain reaction with the thirty or more other guards' horses, and, for a terrifying moment, a potentially deadly mayhem broke the quiet Scottish hillside. "Wahoo!" Diarmad, captain of the guard, a battle-hardened warrior despite his score of years, expertly worked the reins. Within a matter of minutes, his and the rest of the men's horses were back in their riders' control. Diarmad slid off his mount and knelt beside her. He wrapped a strong arm around her shoulders as he guided her upright. With a firm grip around her wrists, he pried her trembling arms away from her face. Kind amber eyes considered her. "How did ye fall off the mount, lass?" The soft question was followed by a hard look as he shifted his gaze to her mistress, still seated proudly on her mount, as if he had already guessed what had happened. Ceana bit her lip to stop it from trembling. Terror paralyzed her as she followed his gaze. "Get her on her feet and let's get going." Sorsha demanded. "I have a wedding to attend, in case 'tis escaped yer wee minds." Ceana winced and forced herself to meet Diarmad's gaze. "Sorsha is very nervous," Ceana said quietly. "She means nay disrespect." Diarmad shook his head. "Never mind, lass," he soothed. "How is it ye ended up falling from yer horse and all but breaking yer bonnie neck?" Heat seared her cheeks with the unexpected compliment, the first compliment she had ever received in her twenty years of life. "I'm clumsy, is all," she muttered, hating the lie but knowing Sorsha's vengeance would be immediate and painful if Diarmad should call her mistress on her actions. As it was, the tender flesh on the inside of Ceana's arms and thighs were constantly marred with bruises from Sorsha's and her mother's vindictive pinches. At least Lady Gormal and Laird Sinclair had been unable to accompany their daughter on this journey. Eventually they would join her, but for this short time Ceana only had Sorsha to deal with. Diarmad raked an impatient hand through his thick mass of reddish-brown hair and shared a knowing look with the other guards, including the handful of Sorsha's own guards, who had also dismounted and stood in a semi-circle around her. "Why do ye protect her, lass?" he asked quietly, gesturing his men back to their horses then helping her to her feet. The earth tilted and she swayed. Diarmad's big hands curled around her arms to steady her. Pain seared through her left arm and it throbbed relentlessly. The material of her threadbare dress was torn and bloody where the ground had scraped it. "As soon as we reach Castle Stonewood I'll be reporting ye all to the laird." Sorsha said with derision. "Ye are my escorts, not that little snit's." Diarmad cursed under his breath, something Ceana noticed he had done often since they began their journey that morn to Castle Stonewood. A journey they should have been able to accomplish on mounts in half a day. Despite Sorsha's commands, Diarmad took Ceana's arm in a gentle grip and gave it a careful examination, slowly bending it at the elbow, then lifting it over her head. She bit her lip to keep from crying out as he did so and she was relieved that, although it hurt, it did as it was bid and therefore was not broken. Diarmad confirmed her conclusion. "'Tis not broken, lassie, but 'tis going to hurt for a good while. Try not to do any heavy lifting until it has a chance to heal up a bit." She forced a smile to her lips, hoping he would not see the resignation in her eyes. Sorsha would have her doing twice as much work as punishment for taking the attention away from her. Diarmad led her back to Sorsha. "That," Sorsha pointed at Ceana, "is walking the rest of the way." She kicked her horse's flanks and set off at a trot, leaving her guards to scramble back to their own horses to catch up with her. "It is okay, Diarmad." Ceana strove to reassure him. "I don't mind walking." "The lass can ride with me." Stephen offered, his pale cheeks blooming bright red as they made their way back to the remaining guards. Diarmad's lips formed a thin line as he watched their laird's betrothed and her men in the distance. "Aye, that will do." Carefully, as if he were handling something precious, Diarmad handed her up to ride behind the guard. She had never ridden behind a man before, although in truth Stephen looked to be about the same age as she. Embarrassed, sore from her fall, and knowing she would pay dearly for the guard's kindness, she pressed her forehead into Stephen's back, praying they would reach Stonewood soon. Her future was unclear and frightening, she thought as the steady gait of the horse lulled her into that odd place between awake and asleep. Heaven help her if Sorsha should convince her new husband, the Laird Anderson, of her low opinion of her maid. Old Meg had told Ceana he was a fierce and mighty warrior, The Silent Scourge of Scotland, he was called, known to slay six Vikings before he breaks his fast each day. The only reason he had been willing to wed Sorsha had been because Sorsha's father, the Laird Sinclair, now held his wee brother Sionn as a hostage behind the tall walls of The Sinclair stronghold. Laird Sinclair needed the alliance of the Anderson clan. Norwegian pirates, Vikings, raided the coastal cities each spring when the western winds swept them ashore and they did not leave until the eastward winds took them back to their shores in autumn. Nay longer content with pillaging the churches, they were steadily making their way inland, sacking and overtaking each stronghold, castle or village they came across. The Sinclair had tried to arrange the marriage of Sorsha with The Anderson in order to build an allegiance and gain protection should the Vikings make their way to the Moor of Balvack, which was but a day's walk from the coastline, but The Anderson had flatly refused. Ceana sighed, if he had agreed, the union would have only been to advantage of Sinclair, for Sinclair's coffers were empty more often than full and his army was unskilled and lazy due to the Sinclair's love of drink rather than training his men. The Anderson on the other hand, had taken back Castle Stonewood from the Norwegian invaders who had stolen it from his clan the spring before while he had been away. He had slain all the warriors who had taken over his home and had murdered his uncle the laird and many of his kin. The clan had chosen him as their new laird, pledging their loyalty to him wholeheartedly. The Silent Scourge had been declared The Anderson that day. Riches from the Vikings conquests filled their storerooms, or so she had heard, and the new laird fiercely protected those riches and the borders of Ohar Dheathain. When The Anderson refused to ally himself through marriage to Sorsha, Sinclair had gone into a rage and vowed one way or another the alliance would be made. It had only been by chance that whilst he and his men had stalked through the woods behind Castle Stonewood on their way back to the moor, the young brother of The Anderson had snuck out of the tall gates with another lad, apparently set on exploring and adventure. The lad had gotten more than adventure. He had been kidnapped. The boy with him had been sent back inside the gates, beaten and terrified, telling The Anderson if the marriage did not take place, and a babe planted in his daughter's womb within a month's time, his brother would die. If Sorsha schemed to keep her new husband from her bed, his brother's life would be forfeit. Ceana shuddered once as sleep blurred her worries. All she had to do when they arrived at Castle Stonewood was keep Sorsha happy, somehow encourage her mistress to accept her new husband without seeming to do so, and stay out of The Silent Scourges way. Surely she could do so, for she had spent her whole life perfecting the art of being invisible.